Join the luck of the Irish on a quest through a leprechauns’ brewery where a range their favourite drinks form the theming to this online slot game. This is one for keen slot players with an impressive win option of up to 2,270x your original stake. This is a rather unique slot game because there is 1,125 ways to win, making the invitation to play more than just an interesting theme. 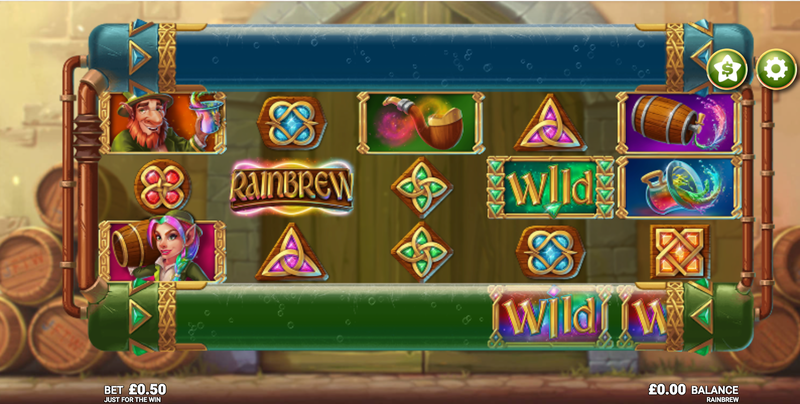 Loose yourself in an enchanted brewery with bright animations such as beer barrels making up the background of Rainbrew slots. There is also cheery Irish music in the background to help you feel at home in the Irish brewery. Just for the Win is pretty fresh in the online gaming industry, their studio was first launched in 2016 and they have been developing games since. Most of these have been on the market since 2017. The Gothenburg (Sweden) based company aims to maintain an international focus with a mission to produce high quality online slot machines and games which will be appreciated by avid slot players. There are 10 pay symbols in this game. The lower paying symbols resemble five gem arrangements in the colours of green, blue, orange, purple and red. Then, look out for a pipe, a beer glass and beer barrel. The highest paying symbols are the two leprechauns who work at the brewery and produce that magical Irish brew. There is a sidewinder feature which will increase the chances of winning, through showing wild and scatter symbols as well as optimising winning chances on the free spin rounds. There is also expanding wilds to benefit from which means that the chances of winning are good and there is the option to enjoy the auto play feature, making it easy to engage with the theme for up to 100 spins. To gain the maximum win of 2,270x your original bet on this magical – all be it slightly complicated slot game – is to land a block of three wild symbols. If these rainbow coloured wilds cover the top and bottom and cover the three middle reels, 125 winning combinations will be released! The blue wild will appear on the bottom Sidewinder reel, awarding an additional spin on the top reel! The green Bottom Wild appears on the top Sidewinder reel only, giving you an additional spin on the bottom reel! This will continue until no blue or green wilds land on either of the reels. These expanding reel features are still unique to the market and certainly give players a reason to return. This theme is entertaining and an exciting opportunity for keen slot players to engage in a range of additional features which can impressively increase the chances of winning. It is definitely worth a visit to the Irish brewery for a unique experience of playing slots online. On top of everything else, players will be kept entertained through the Irish music and auto spin element which gives time to take in the slightly more confusing expanding reels.